Dawson Creek Art Gallery, Mile Zero, Alaska Highway. In 1947 Dawson Creek was the largest grain producer in the British Empire, and by 1950 8 grain elevators lined up along the Alaska Highway. This one was built by the Alberta Wheat Pool in 1948. However, by 1980 6 of the elevators had been replaced by modern concrete ones, and all across the prairies the wooden structures that had stood for 100 years were disappearing. 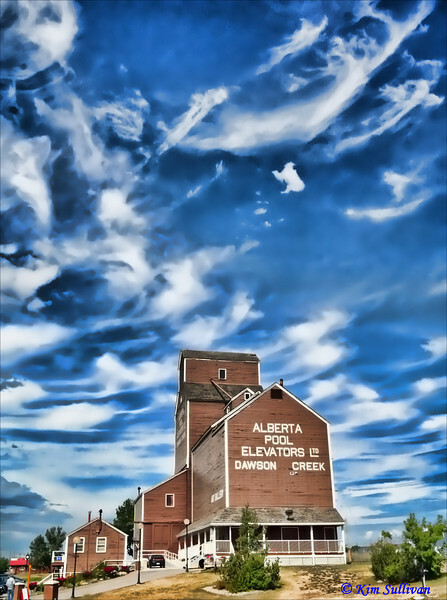 The Alberta Wheat Pool sold "Elevator #2" to the city of Dawson Creek for $1.00, and it was moved to it's present location. The Art Gallery opened in 1983.